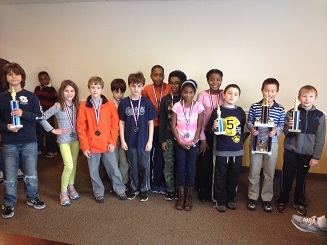 Despite several competing tournaments in the area, nineteen students participated in today’s K-8 Championships. 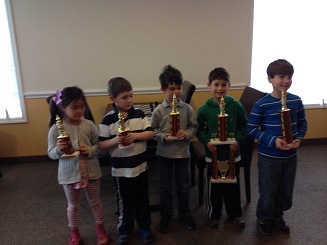 Tournament veteran Jack Cole won the K-2 section with a perfect score! Special mention to Alex Sklute and Jenna Ho for doing a great job participating in just their second and third tournaments respectively! CCFC Dream Teamers Daryl Lavin and Anibal Loureda were co-winners of the K-5 section. Dwight Koyner, Gabriel Marous, Austin Fecke, Zachary Ruban, Maigan LaFontant, and Sophia Ruban all did well competing in their first tournaments! 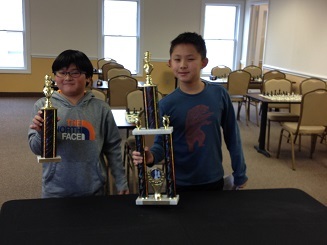 The K-8 section was decided in the final round show-down between Vincent Xu and Joseph Ho. Vincent eventually won a very long tense game to take first place, while Joseph won second!